(CNN) -- They scream germs: Used gum. A flock of pigeons. A tomb covered with kisses. The Blarney Stone in Ireland received more than 400,000 visitors in 2008, many who kissed the lucky stone. These bacteria-infested attractions have topped an unusual list compiled by editors at TripAdvisor.com, a travel advice Web site. This summer, editors at the site named the five "germiest" tourist spots in the world. Despite the H1N1 scare that went global this spring, tourists haven't stopped spitting out their gum and sticking it onto a wall already saturated with millions of gooey pieces, editors say. Nor do germ fears stop travelers from journeying to the pigeon-infested St. Mark's Square in Venice, Italy, where the birds often bestow droppings. "These places are great attractions regardless of the fact that they are 'germy'," said Brooke Ferencsik, a travel expert at TripAdvisor. "Venice is lovely, and it's a great spot, but with all the pigeons, I'd bring an umbrella just in case the birds drop some gifts from above." Though it is unlikely to get sick from visiting one of these places, health experts say germs are always a gamble. The more people who touch and visit a spot, the more germs there are in the mix, they say. Their traveling advice? Travelers should load up on hand sanitizers and wash their hands often on their trips. Where the Blarney Stone came from and how it got to Ireland is a matter of debate. One old tale goes: Once upon a time, the king of Ireland saved a woman drowning in Blarney Lake. The woman told the king that if he kissed the stone, he would receive the gift of eloquence. Last year, about 400,000 people kissed the stone, says a spokesman for Blarney Castle & Gardens. To do so, the person must be hung upside down to kiss the rock. Some people prefer watching to smooching. 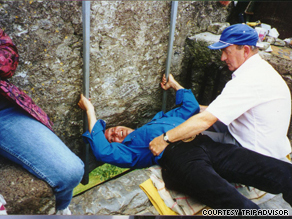 Chuck Gerba, a professor of microbiology at the University of Arizona, visited the Blarney Stone in Ireland last year and refused to kiss the same spot where millions of tourists had put their lips. "My wife did it," he added. "And I wiped her lips before I kissed her." The Gum Wall, also dubbed the Wall of Gum, is one of the strangest attractions in Pike Place Market, where visitors can go to watch fish throwers and see the original Starbucks. "People will do artwork with the gum," said Jay Hitt, the marketing director of the Market Theater. "They write words on the wall, stick posters and business cards." The gum-sticking tradition began by accident in 1993 when patrons, mostly college students waiting in line for a show, would stick gum to the wall. Theater company workers say they scraped the gum routinely, but eventually gave up. Slowly the gum amassed. Today, there aren't any rules at the Gum Wall. Visitors from all over the world snap photos next to it and leave as many pieces of their own gum as they want. In the heart of Venice, Italy, lies St. Mark's Square, also known as Piazza San Marco, where both tourists and pigeons flock. Each year, more than 2 million visitors venture to St. Mark's Square to see the Doge's Palace and St. Mark's Basilica. Thousands of the dirty birds crowd the square sometimes leaving their droppings or attacking visitors. Some fearless visitors who aren't worried about germs snap pictures with the birds. But health experts warn that birds are notorious for carrying dangerous germs and viruses. If you want to see the famous pigeons, go soon. In 2007, city officials have worked hard to remove the pigeons from the square. They have banned people from feeding them and have even started trapping the birds in nets, significantly reducing the pigeon population. What do George Clooney, Clint Eastwood and Marilyn Monroe have in common? All three of them are celebrated stars with their hand prints molded into the concrete of the forecourt of Grauman's Chinese Theatre for millions of people to touch. The sidewalk is littered with 246 celebrity hand and footprints that draw in 4.5 million visitors a year, many of whom put their own hands and feet on them. The site began as an accident in 1927 when Norma Talmadge, a famous actress in the 1920s, stepped into wet cement. Creator and owner of the theater, Sid Grauman, decided to make the hand and footprints a tradition. "The stars are selected based on the longevity of their career," said Levi Tinker, a tour guide at the Grauman Theatre. "Stars who will be around 10 to 20 years from now are picked so people know who they are." For germ-conscious travelers, Tinker says the concrete is mopped daily and pressure washed once a week. It's an unusual site in the Père Lachaise Cemetery in Paris. Author and playwright Oscar Wilde's body rests in a tomb speckled with lipstick marks from visitors from all over the world showing their literary appreciation. Wilde, who died in 1900 from cerebral meningitis, continues to be a celebrated literary figure today famous for his tabooed sexuality at the time and his novels such as "The Picture of Dorian Gray." The kisses display a rainbow of colors -- so much so that travel experts say Oscar Wilde's name on the tomb can be hard to discern sometimes. One TripAdvisor traveler wrote after visiting the grave, "The tombstone of Oscar Wilde is ... well, wild, excuse the pun."